On big Scottish rivers like the Tay spinning for salmon is permitted and for those of you who think there's less skill involved in using a spinning rod then maybe this article will make you think again. Spinning a lure effectively involves real skill too and 'lure mentality' is 100% the name of the game. The 'harling' boat on the River Tay does well when there's an experienced boatman at the helm due to one simple fact and that fact is 'thorough' water coverage. The reality is you don't have to hire the boat & ghillie for the day to achieve this if you're reasonably fit and understand the power and effectiveness of good water coverage. Far too many times I see spin fishers wasting their time on the riverbank so here's a few pointers to what I know consistently catches salmon on a spinner. Let start with a mention of the hooks that all 'detached' lure manufacturers still unbelievably rig their lures with. Get those treble hooks off and into the bin and rig your lure with a micro barbed single hook that's strong enough not to be opened up by the strain of a big fish. Here's the Cox & Rawle single hooks I personally like & endorse. A big treble hook will 'death sentence' any salmon via injury even if the fish swims off strongly as a fungal infection will likely soon set in to the wound and kill the fish. Apart from the damage to the salmon's mouth during the fight more serious damage occurs when the fish is netted when one of the treble hook points inevitably catches in the landing net mesh as the salmon writhes. Don't just play at 'catch & release' so get rid of those treble hooks and gain faith in how just as well a strong single hook works on any salmon lure which hook just as effectively and guarantees the fish's long term survival after release. Many of these articles I write go heavily into the concept of 'sub surface' thoughts when using a fly rod but nothing should change when the spinning rod comes out as it's exactly the same thought process that's required if success is high on your agenda. Just the same way many fly fishers fail the vast majority of spin fishers don't move effectively and 'switch off' when their lure hits the water. Correct and thorough water coverage with a fly or spinning lure is what catches salmon and nothing else. When using a spinning rod you must have a 'solid' water coverage plan in your head that will allow your lure to travel effectively through every couple of square yards of water while searching out the salmon pools for a cooperator! A 'willy nilly' flick here or there paired with inconsistent riverbank movement is a complete waste of time on the Tay where there's always going to be a big cubic foot of water to salmon ratio even when the river is full of fish! Personally I always found a slightly upstream squarish cast with a steady retrieve the most effective presentation for a lure as that made the lure's retrieve into a lovely big 'not too fast & not too slow' curving swing. The key to the deal for effective spin fishing water coverage is to make sure the angle of cast and distance is consistent and as importantly making sure each casting position is separated by 'exactly' one 10ft rod length. It's really your boots that catch salmon on the spinner (or a fly) if you really think closely about it as good riverbank movement equates to effective water coverage which is the 'real' key for success with all salmon fishing applications. If you've taken on board the 'angle' of cast and the critical 'casting position spacings' stated in the above paragraph then the only other things to consider are depth of lure and setting the hook when a salmon takes. After casting and on the lure's impact on the water you can count your lure down for a few seconds if you feel a deeper retrieve depth is required. You should always have a 'feel' for the depth of the pool you are fishing so you know if & when fishing a deeper lure is appropriate. You should also be 100% aware of where your lure is at all times and especially when it comes close to the end of the retrieve to keep it off the likely shallower riverbed. I know I sound like a broken record but forget deploying any of the above if you're going to continue to fish with a slack clutch setting as most hard earned offers on the spinner will more than likely remain as brief encounters! Tighten your clutch up so that line can still be drawn off the spool but 'only' with a fairly strong pull. That's the correct amount of pressure to set a large hook at range in the typical 5 seconds you've got to achieve a good hook hold or your salmon is likely to say bye bye prematurely! 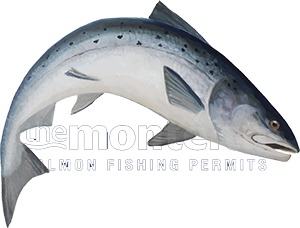 Without a reasonable amount of logical hook point pressure when the salmon takes the lure the hook won't be set well enough and the fish will get rid of it soon into contact. Once you know you've set the hook properly then (and only then) ease of the clutch setting to play the fish. If you get your consistent lure cast angle and distance correct and move 10ft between each cast and count the lure down when you feel the need while all the time fishing with a tight initial clutch setting then get your seatbelt on! You'll now be close to the effectiveness of a River Tay 'harling' boat as your water coverage will be colossal. After a dozen or so casts following the above casting position spacings turn upstream to where your starting position was and you'll be amazed at the water you've already covered! Keep that cast spacings movement going throughout the full course of the salmon fishing day and the law of averages will tell you that if there's a taker in the beat your lure is very likely going to find it!